ALL OUR ITEMS ARE CUSTOM MADE, PLEASE ALLOW SOME TIME FOR PRODUCTION. If you need your gift for a certain date, please let us know that in comment box. 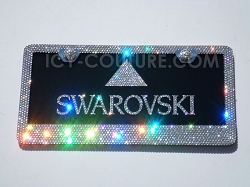 ICY Couture 3 Row Swarovski Crystal Bling License Plate Tag Frame. Whats Your Color? 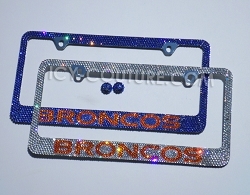 TWILIGHT Swarovski Crystal Bling License Plate Frame. Whats your color? 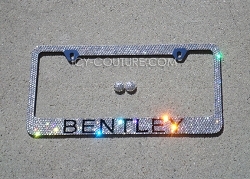 BENTLEY License Plate Frame Swarovski Crystals. Whats Your Colors? 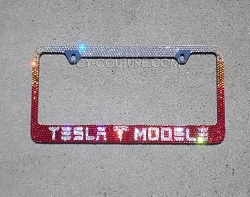 TESLA (your) MODEL Swarovski Crystal License Plate Frame. Whats Your Colors? 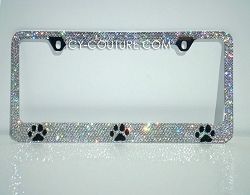 PAW Prints License Plate Frame with Swarovski Crystals. Whats Your Colors? 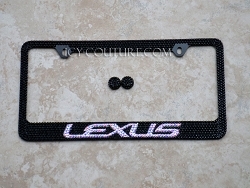 Custom LEXUS License Plate Frame with Swarovski Crystals. Whats Your Colors? 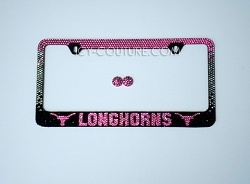 3D CRYSTAL BOW Pink License Plate Frame Swarovski Crystals. Whats Your Color? 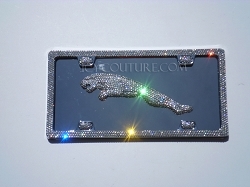 3D JAGUAR License Plate Swarovski Crystals. 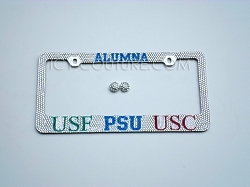 YOUR SCHOOL Swarovski Crystals License Plate Frame. 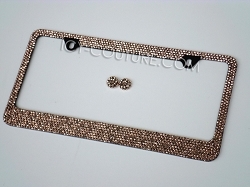 3D Mercedes License Plate & Frame - 24K GOLD or ROSE GOLD Swarovski Crystals. 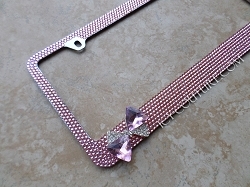 Cotton Candy Swarovski Crystal License Plate Frame. Whats Your Colors? 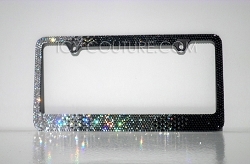 Blacked out TWILIGHT Swarovski Crystal Bling License Plate Frame. Whats your color? 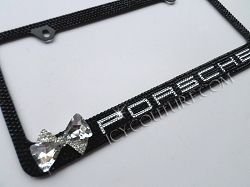 3D CRYSTAL BOW Swarovski Crystal License Plate Frame. Whats Your Color? 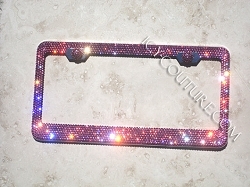 TWILIGHT AB Swarovski Crystal Bling License Plate Frame. Whats your color? 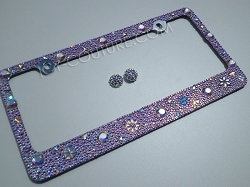 WHEELS OF GRACE Custom Swarovski Crystals License Plate Frame. Whats Your Colors? 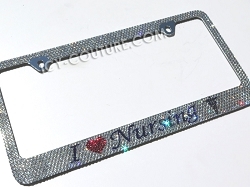 ELEGANT HEARTS - Swarovski Crystal Bling License Plate Frame with HEARTS. Whats your color? 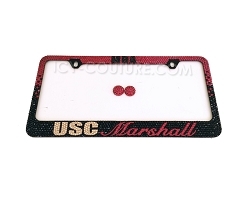 OAKLAND RAIDERS - Swarovski Crystal License Plate Frame. Whats Your Sports Team? MUSTANG COBRA - Black on Black Swarovski Crystal License Plate Frame. Whats Your Colors? 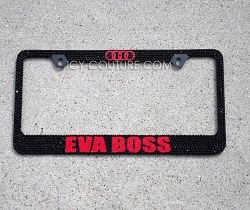 BELLA - Black on Black Swarovski Crystal License Plate Frame. Whats Your Colors? 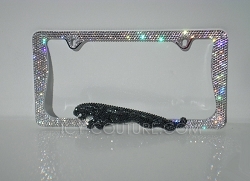 NISSAN Swarovski Crystal License Plate Frame. Whats Your Colors? 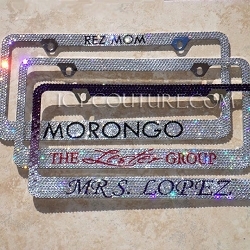 LEXUS Swarovski Crystal Custom License Plate Frame. Whats Your Colors? 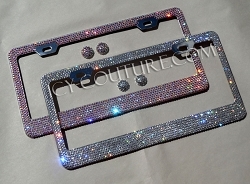 Cadillac ESCALADE Crystal Bling License Plate Frame. Whats Your Colors? 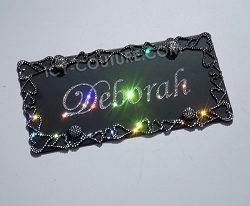 CUSTOM NAME License Plate with Swarovski Crystals - Black or Chrome. 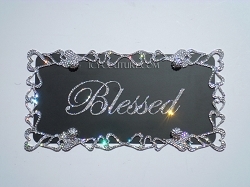 CUSTOM MESSAGE on BLACK - Swarovski Crystal License Plate Frame. DODGERS FAN Swarovski BLING License Plate Frame. Whats Your Team? 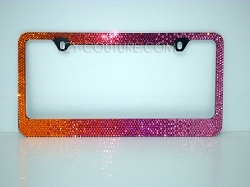 LEXUS Pink to Purple OMBRE Swarovski BLING License Plate Frame. Whats Your Colors? 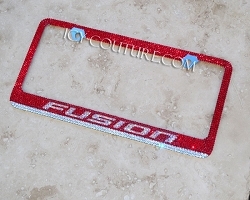 FUSION License Plate Frame for FORD FUSION. Whats Your color? Indianapolis Colts Crystal License PLATE. Whats Your Colors? 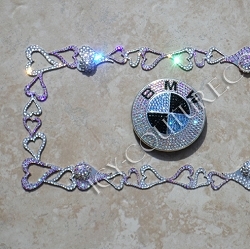 QUEEN B License Plate Frame Swarovski Crystals. Select Your Color! 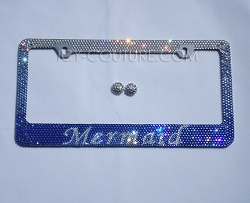 Your WEBSITE NAME in Crystals License Plate Frame. Whats Your Website? 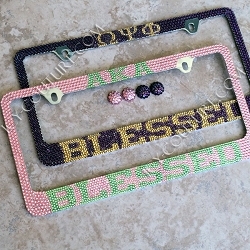 WINGS OF STRENGTH Crystal License Plate Frame. Whats Your Colors? 3D Crystal HONDA License PLATE. Whats Your Colors? 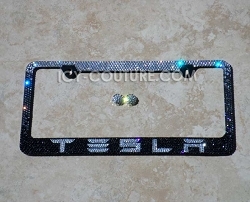 Black Crystal PEACE License PLATE. Whats Your Colors? Crystal CAMARO 3D Logo License PLATE. Whats Your Color? 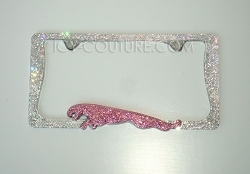 LEOPARD PRINT custom ICY COUTURE Crystal License Plate Frame. Whats Your Colors? WAR VETERAN Crystal License Plate Frame. Whats Your Colors? 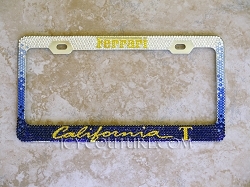 2-color Fade with Your message Crystal License Plate Frame. Whats Your Colors? 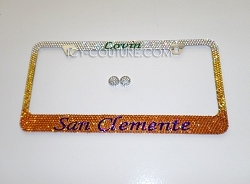 TWINS - custom message Crystal License Plate Frame. Whats Your Colors? 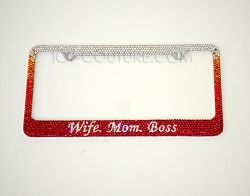 FABULOUS - custom message Crystal License Plate Frame. Whats Your Colors? 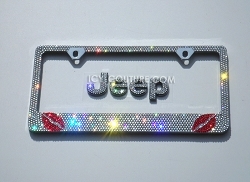 ICY ROCKS - bedazzled License Plate Frame. Whats Your Colors? 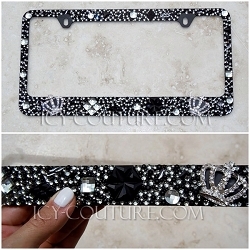 COCO BoPeep ICY Couture Crystal License Plate Frame, made for COCO. Whats Your Message? 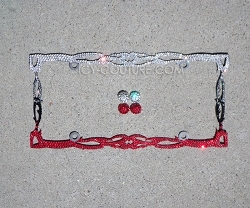 DESIGN YOUR OWN 3D Rhinestone License Plate Frame by ICY Couture. Select Your theme! 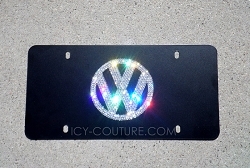 Your Message - ICY Couture Custom Crystal License Plate Frame. 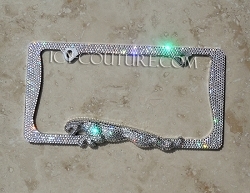 Icy Couture Crystal MOTORCYCLE Frame "Old Hollywood Glam"
Crystal INFINITI 3D Logo License PLATE. Whats Your Color? Crystal ACURA 3D Logo License PLATE. Whats Your Color? 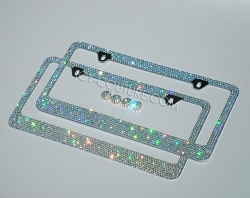 Crystal MERCEDES 3D Logo License PLATE. 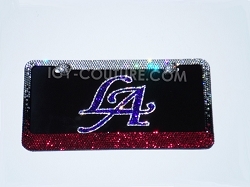 Crystal LEXUS 3D Logo License PLATE. Whats your color? 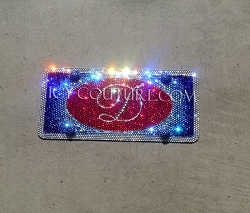 Custom print ICY COUTURE Crystal License Plate Frame. What's Your Pattern? 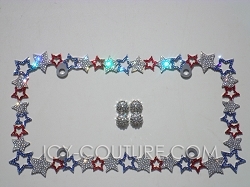 Provide Your Own Custom Frame to get ICY Couture make over! 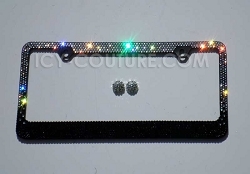 BMW 3D Logo License PLATE bedazzled with Swarovski crystals. Whats your color? 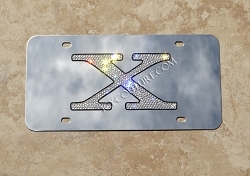 LEXUS Swarovski License Plate Frame. Whats Your Colors? 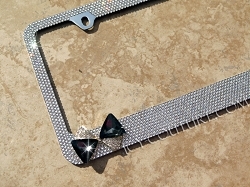 BLACK DIAMOND Old Hollywood Crystal License Plate Frame! 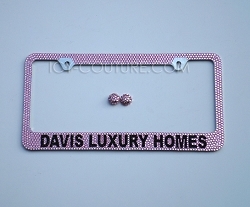 Crystal PINK Bling License Plate Frame! Whats Your color? 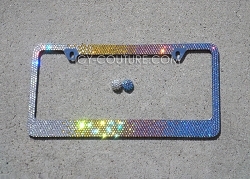 Your Message -Custom Swarovski crystals bedazzled License Plate Frame - Whats your colors? 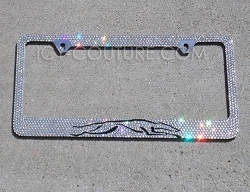 Sparkling-hot Range Rover License Plate Frame. Whats Your car model? 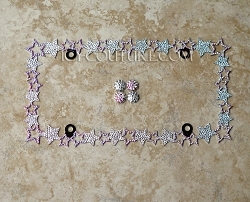 OUTLINE YOUR FRAME with Swarovski Crystals! 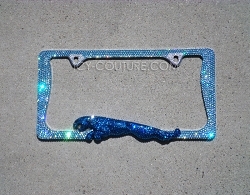 JAGUAR - ICY Couture License Plate Frame. Whats Your car model? 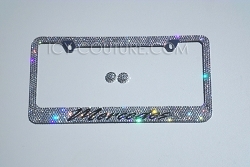 MERCEDES License Plate Frame Swarovski Crystals. Whats Your Car Model? 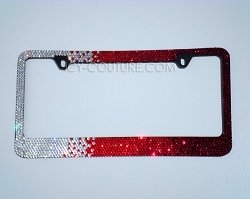 Crystallized BMW License Plate Frame. Whats Your car model? Click your favorite style of frame, select your crystal colors and other options. 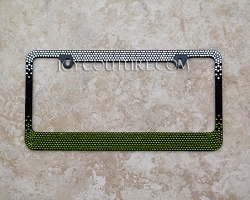 You can also suggest custom design, if you dont see desired style of plate/frame in our gallery. 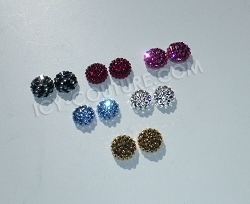 The price for new design will stay be the same as for similar detail in our gallery.